Click the specimen to view a larger image. 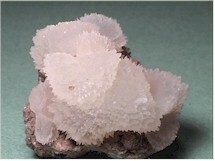 A very nice miniature of snow white calcite scalenohedral crystal groups on what appears to be a galena/pyrite matrix. 5cm across. Quartz / Pyrite: Herja, Romania. Clear quartz crystals on sphalerite matrix. A nice miniature, 5cm across. Apatite w/Schorl: Minas Gerais, Brazil. 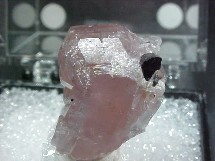 This is a dashing thumbnail of pink apatite, with a dash of schorl here and a sliver of schorl there. It is from the Golconda Mine, Governador Valadares. 3/4" tall x 1/2". Phantom Fluorite: Eastgate Co., Durham, England. 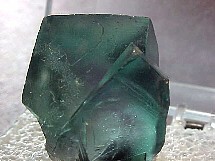 This great greenish-bluish, transparant thmbnail, comes from the Blue circle Quarry. 3/4" tall x 1/2". Beryl var, Aquamarine: Gilgit, Pakistan. 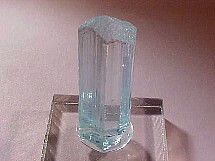 A 100% gem quality, terminated aquamarine crystal. Just over 1" tall. Mimetite: Santa Eulalia, Chihuahua, Mexico. 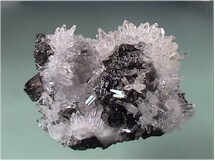 Calcite crystals and mimetite with very minor matrix. 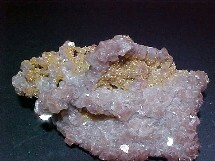 What a color combination of purple and yellow on this miniature from the El Potosi Mine. This piece sparkles from both front and back. 2-1/2" x 1-1/2"